We had a great time in New Haven. Thanks to the Yale Bookstore for having us. 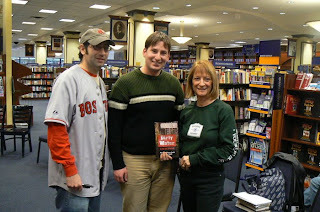 We also did an interview that day with John Valeri of the Hartford Examiner (pictured between Jere and Mary-Ann), and part one of that interview appears here. We'll have more events in April. We're also excited about being a part of the BEA convention in NYC in a few months. Stay tuned for the full schedule.